Jesse F. Gregory III, Ph.D.
Jesse Gregory is an expert on the chemistry, metabolism and nutritional function of B-vitamins. 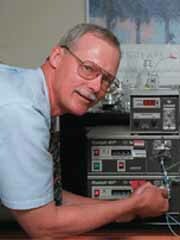 Much of his work focuses on vitamins B6 and folate. Adequate intake of both of these vitamins is needed for normal metabolism, cell replication and maintenance of health. For example, adequate intake of these vitamins reduces the risk of cardiovascular disease, and adequate folate intake helps reduce the risk of certain birth defects and certain forms of cancer. Gregory and his colleagues have developed and applied a number of innovative methods involving the use of nonradioactive isotopic tracers, with which the absorption, metabolism and metabolic function of these vitamins can be determined in human subjects. Application of these methods allows direct investigations in humans without the potential hazards of traditional radioisotopic tracers. Studies based on the use of these isotopic procedures have had direct impact on national nutrition policy. Recent changes in the Recommended Dietary Allowances for folate were based largely on results of Gregory and colleagues showing that the requirement is approximately twice that previously believed. In addition, the recently implemented fortification of cereal grain food products (bread, flour, rice, pasta, etc.) with folic acid was supported by UF studies showing that such fortification is an effective way of delivering the vitamin in highly absorbable form. Although the natural forms of folate in many foods is not efficiently absorbed, Gregory and colleagues found that orange juice is also a good source of readily absorbable folate. Gregorys research is now mainly directed toward determining optimal intakes of folate and vitamin B6 to maintain optimal one-carbon metabolism to control the level of the metabolite homocysteine associated with risk of cardiovascular disease. One major goal is to determine the impact of common genetic variability among humans on their vitamin requirements. Gregory has served as a member of the NIH Nutrition Study Section, USDA Review Panels on Human Nutrition and a number of other advisory panels. He also has served on National Academy of Sciences Institute of Medicine Committees that developed policy recommendations for the nutritional labeling of foods. He currently serves on the editorial boards of the Journal of Nutrition and the Journal of Food Composition and Analysis.